A supernatural tale that’s chilling in more ways than one. With her first novel – which follows a string of well-received short stories – Alison Littlewood does something really very clever. As you might expect from a ‘Richard & Judy Book Club’ pick, the story will not only appeal to fans of the horror genre, but also to more mainstream readers… extending its audience range considerably. After losing her soldier husband, Cass ups sticks and takes son Ben to thevillageofDarnshawup on the moors, where she herself once lived as a child. Her arrival, in foggy conditions so dangerous she can’t see more than a few feet ahead, should have been warning enough that this was a bad move – but she perseveres, flitting into a newly renovated mill. So newly renovated that work is still being done on it (though no actual workmen are around) and they are the only tenants. But that pales in comparison to what’s happening with the strange locals and Ben’s obnoxious behaviour – acting out well before he hits his teens. It isn’t until they get snowed in there, however, that Cass experiences the truly terrifying isolation of this place, with its stone circle not far away; some even call it the ‘witches’ circle’. Can she get herself and Ben away from Darnshaw before it’s too late? 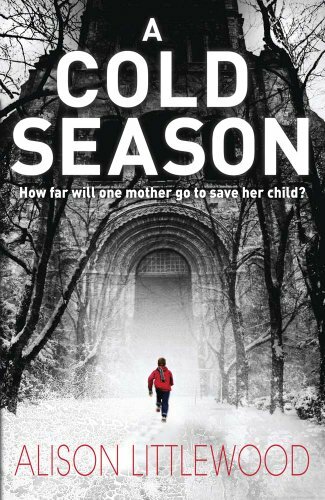 Drawing on real trips the author made for work between West Yorkshireand Saddleworth, the setting of A Cold Season is brought effectively and believably to life. Anyone who’s ever been cut off by snow will be able to relate to Cass’ all too credible predicament and failed efforts to contact the outside world. And that’s just the start of her problems, as the creepiness is ratcheted up by degrees (including one shivery and memorable moment involving snowmen) throughout the storyline until we reach the climax – or maybe that should be climaxes, plural? The characters are well rounded, even the bit part players, and the tentative relationship between Cass and stand-in headmaster Remick (seemingly her only ally) is beautifully observed; we run the gamut of emotions with her, from attraction to excitement, then guilt about her husband. In a similar way to books like The Woman in Black, this novel will probably end up being a favourite for a lot of readers – it’s simply a bonus that it’s also a cracking genre novel. It bodes well for more offerings from this talented writer in the future, too.